My favorite YouTube clips are always amazing singers on talent shows, or in their living room for that matter. I mean, who can resist a little 13-year-old boy on Australia’s Got Talent belting out Whitney Houston? Not to mention, our boy Bieber who was discovered on YouTube and is now a billionaire. If only there was a site solely dedicated to super talented singers to showcase their gift and win contests. Oh yes, there’s SingWho. SingWho is marrying music and social media and popping out some seriously talented babies. It’s a virtual recording studio for aspiring singers, a lounge for artists and judges, and a platform for singing contests to reward artists for their awesomeness. Singers, get excited. You’ll have the opportunity showcase your talents, compete with your peers, grow as an artist and win some cool prizes. As far as discovering new talent, YouTube’s got nothing on SingWho. For Singers: As long as you have a microphone and webcam, you can submit audio clips of you performing songs for the contests featured on the site, or start building a catalog through your own studio sessions. SingWho then creates a comprehensive personal profile for you that includes your bio, talents, etc., other users who are fans of yours and what other singers you are following (think your fave social media sites meet virtual American Idol). For Voters: For all you music lovers who are, well, not vocally gifted, you have an opportunity to find your own talent on the site by voting for contests and establishing yourself as a true talent scout. The coolest feature of the site (in my opinion), is the featured contests for singers. 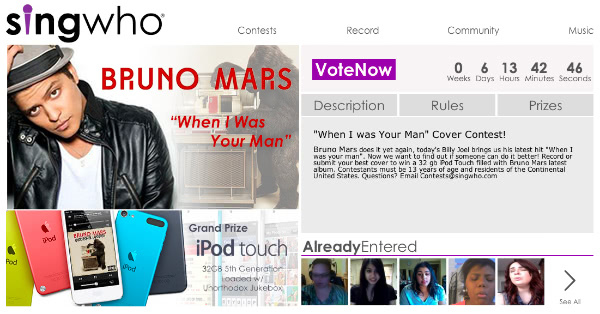 Artists have an incentive to submit their best covers for songs like Bruno Mars’ “If I Was Your Man” for prizes like an iPod Touch. An iPod Touch you say? I can belt out a little Bruno for that! You can view who has submitted their clips for the contest, vote and see if you favorite singer wins. It’s fun, interactive and there are some truly talented people showcased on the site. I’m finding it very difficult to write this article – the site is so addicting! Founder and CEO, Nicholas Semkiw, graduated from the University At Albany with a B.A. in Communication & Rhetoric, a concentration in Political Communication, and a minor in Business Administration. Before the age of 27, Nick successfully founded and exited two former private companies (Royal Heir Clothing & SunCenter). He has significant experience in information technology, media, marketing, and advertising. Recently, Nick has consulted on established branding and marketing platforms for many companies, including Fidelis Care New York, The Due Guard Foundation, Saloncueticals, Inc., Autowash Corp, Troy Knows Training, and Consolidated Elevator, Inc. Co-Founder and COO, Jess Silva, graduated from the University At Albany with a B.A. in Business Administration with a concentration in Information Technology. Jess worked for CGI as a business analyst focused on gathering business requirements, designing user interfaces, and developing and executing test cases. Jess then took a Service Delivery Management Position with IPsoft Inc., working with brands like Cisco, Coca Cola, and the NFL. Jess also founded Help4Thehome.com. I was a huge fan of shows like American Idol and The Voice. I would constantly be on YouTube looking for new and undiscovered talent and then it hit me… Create a website that takes all the great qualities of American Idol, YouTube, and Facebook… and just like that, SingWho was born! Are you currently working on or planning any other projects, websites, or startups? Currently SingWho is the only project we work on. Building a startup takes about 100% of your time, so it’s hard to work on side projects. 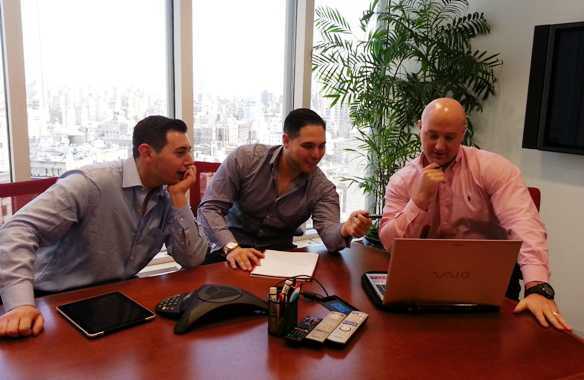 We are lucky though, we have some great investors that take time to sit down with us and give us guidance on some of the more difficult decisions. Our investors include Steel Pier Capital, Actinic Ventures, Ted Hartley (CEO of RKO Pictures), and Ivan Braiker (CEO/Founder of HipCricket). I love the challenge of creating something from scratch! There is nothing more exciting than when you’re in the office spitballing ideas with your team and BOOM! You come up with a new feature, process, or functionality. The thing to remember though, ideas are a dime -a-dozen, it’s all about the execution that makes startups successful. If you’re an amazing singer who wants a platform to showcase your talent and a community to share your talents with (without crazy cat videos and babies laughing for 10 minutes), and possibly win great prizes, or better yet, be discovered and become a mega pop star, you HAVE to check out SingWho. I’m tempted to start my own studio session. Hey, you never know!